A new Postcrossing stamp... from Austria! Blog > A new Postcrossing stamp... from Austria! 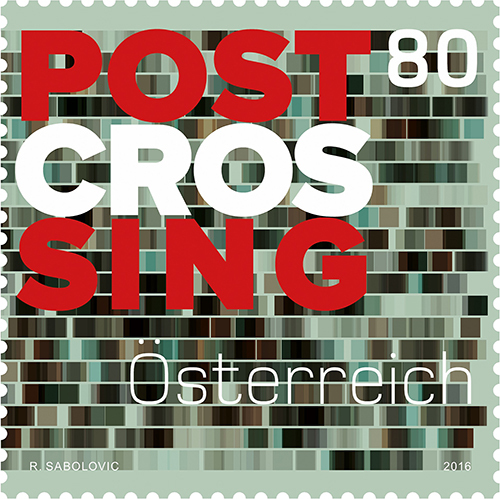 The stamp was designed by Robert Sabolovic and depicts a stylised “wall of postcards”, with the word POSTCROSSING in front of it, painted in the Austrian flag colours. To celebrate the stamp launch, a meetup was held on Hirtenberg’s Kulturehaus today, where postcrossers came together to write and send postcards with the new stamp and special first-day cancellation mark. 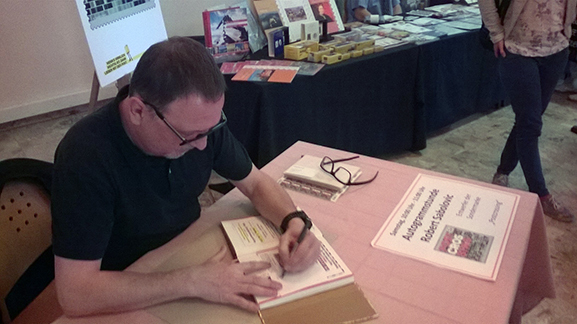 Mr. Sabolovic, who designed the stamp, was also in attendance, and autographed postcards and stamps. Eine sehr schöne Briefmarke,würde mich sehr freuen eine in meinem Postkasten zu finden. Nice stamp from Austria, would like to find one in my Mailbox. Congratulation!!!! Can't wait to receive a postcard with this wonderful stamp. Looks like great fun was had at the meet-up. Great, hope to get one day. And hope, that Deutsche Post will issue one day, too! Wonderful! More and more countries have these stamps now! 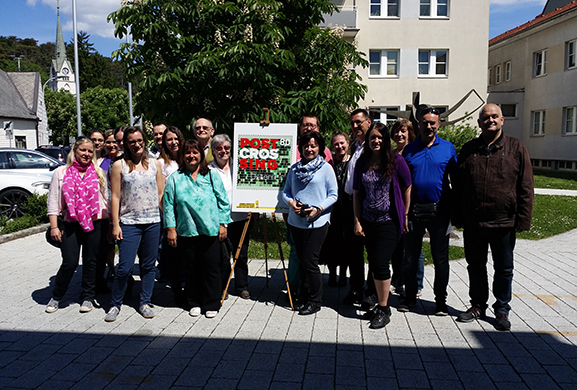 Hey, Congrats to all of you Postcrossers :) great to see you again Sibylle, Anita, Theresa, Sabrina , Susi , Zuzana :) !! @ Stalulol: It will be my pleasure to send you one. So nice stamps i don't know why france doesn't do the same ! Looks like a solid postcrossing stamp. Very nice :D.
Excellent! Well done, combining local identity to global media. Congrats Austrians, be proud of being postcrossers! congratulations! Hope to receive one soon! Congratulations! I look forward to receiving this great new Postcrossing stamp. If anyone would like to send me a card with this stamp, I'd be glad to send you a card in return, with a good stamp(s). I sure wish the Post Office would issue one here in the US!! It's amazing to see how different the Postcrossing stamps from the different countries look like. 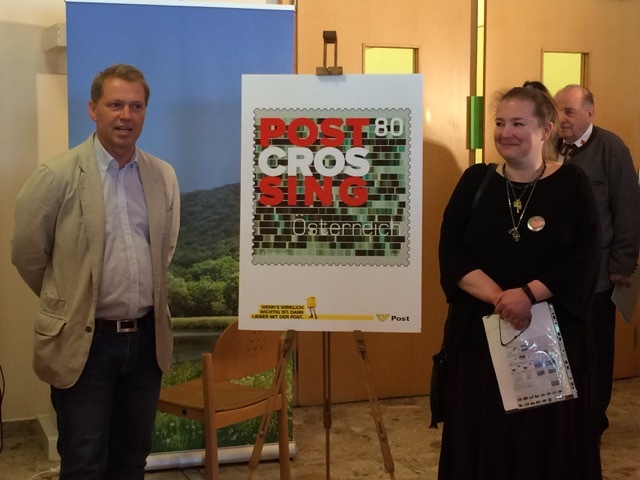 Great Job of the Austrian Postal Service to launch a Postcrossing stamp. And of course I hope to find a card with this stamp in my mailbox. I´m glad that postcrossing stamp was issued in further country. Unfortunately I was unable to attend meeting in Hirtenberg because of work...Good job, Anita! So awesome! Wish we could get one in the US! 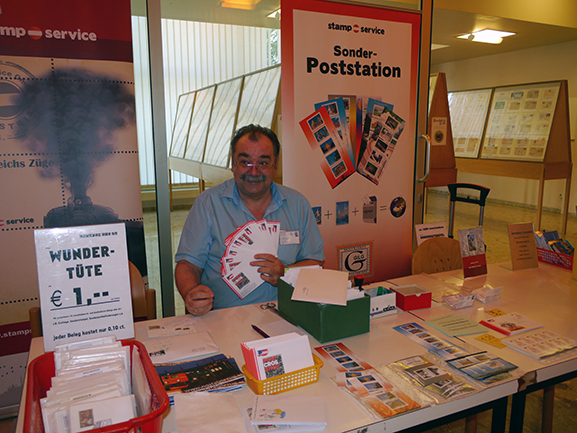 Well done to the PostCrossing visionaries in the Austrian Post Office service! Your new stamp is bright & certainly eye-catching. I hope that Australia Post will follow this international trend with some Aussie PostCrossing stamps! Wounderful ! Looking forward to receive such a stamp :) I hope Germany also will have a postcrossing stamp too ! I hope to receive one some day. Such good news! Postcrossing really unites more and more countries! Oh, and thanks to the comment of DIM1 I now know of the second Postcrossing stamp from Russia. Hope to receive that one too, to make the collection complete! Way to go, Austria! I hope someday to see one on a card in my mailbox. Just got the great meeting- card with the new Postcrossing stamp! Thank you so much Dear Kroete and all you signed it! You made my day, my week! Schade dass ich dort fehle. I received an official card from this meeting, that made me so happy today! :) Thanks a lot to all who signed it. It is great that more and more countrys issue postcrossing stamps and honour this great project that brings people all over the world in contact. I could not participate in the Meeting, unfortunately, but I got 2 wonderful Meeting Cards :) Thank you, Anita (honeybee) and Sabrina (Danube)! I love the stamp and hope one will make its way to my letterbox. Why cannot Australia Post have one? @ bayou-ranger - hope your card will arrive soon too! Its so nice....How can i avail one? I received an official card from the meet-up with fantastic stamp and first-day cancellation, and signed by everyone there. A treasure! Yesterday I found a Hirtenberg postcrossing meeting card with the new stamp in my box - it made my day! It was written by my long-time penpal Sibylle (Robin67)on occasion of the postcrossing stamp issue and signed by the other participants. Thanks so much to you all! And yes, we Germans envy you for your stamp - let's see when we'll finally manage to have one. since i usually dont get cards from austria,i have no hope getting one of those.. Thanks again to Knirin for sending it and everyone who signed it. thank you honeybee for meetup card and great stamp. Congrats Austria !! I've just received a wonderful card with this awesome stamp and special cancellation from this meetup! Thank you to everyone who signed the card, and a warm hug for dearest turtles! That's terrific! I wish we would come up with a US Postcrossing stamp, I would use it all the time. Haven't gotten a card yet with any of the amazing Postcrossing stamps from so many European countries, but I'm hoping! congratulation..and more good is the release of the stamp.. in my india it take lot of time recognise this kind of event by postal dept we too did our meet on MAY 15th with more than 30 post crossers gathering. Congratulation. I like the stamp.